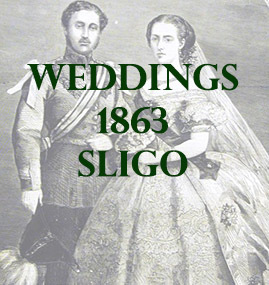 The following list contains marriages that mention places in county Sligo. At Tullyallen, George son of John Douglas Esq., Mullaghmore, to Susannah daughter of the late Wm Robinson Esq., Markethill, County Armagh. In the Wesleyan Chapel, Sligo, the Rev Henry Evan, Belfast, to Henrietta, daughter of the Rev. E. M. Banks, Sligo.